The many character education programs and activities in Rainbow Schools complement the Board’s Discipline Policy, which promotes responsibility, respect, civility and academic excellence in a safe learning and teaching environment. By nurturing a strong partnership between the school, the home and the community, Rainbow Schools ensure that students receive an education that includes personal, social and citizenship development. Respect, responsibility, honesty, integrity, fairness, inclusiveness, teamwork, trust, initiative, perseverance, determination, optimism and compassion. These are some of the individual qualities being nurtured in students both inside and outside of the classroom. Character education not only encourages students to become positive and productive members in a global society, it also instills in them skills that are essential for learning and for life. In Rainbow Schools, the school staff will display and communicate the school’s expectations, teach the rules and procedures of the school, teach any behavioural and social skills necessary for school success, and provide leadership and other learning opportunities to all students. Staff will also encourage and reinforce appropriate student behaviour, provide students with feedback and evaluation regarding their behaviour, undertake to be good role models, provide structure and supervision required for the prevention of misbehaviour, and partner with parents/guardians to build student success. School personnel use many strategies aimed at producing appropriate student behaviour. Engage students in special programs for anger management, social skills, etc. For students, character education is about having a sense of responsibility to complete tasks with reliability, dependability and commitment. It’s about pursuing valuable goals with determination and patience while exhibiting fortitude when confronted with failure. It’s about treating others with kindness, compassion, and generosity. It’s about demonstrating hard work and giving your best regardless of the obstacles. It’s about being law-abiding citizens and making a positive contribution to the school, the community and the world in which we live. It’s about telling the truth and admitting wrongdoing, being trustworthy and acting with integrity. It’s about doing the right thing when faced with tough decisions, following your conscience instead of the crowd. It’s about practising justice, equity and equality, co-operating with one another, recognizing the uniqueness and value of each individual within our diverse society. It’s about showing high regard for authority, treating others as we would want to be treated and understanding that all people have value as human beings. It’s about letting moral values guide choices and putting service to others before self. In Rainbow Schools, character education is a positive and proactive approach to moral development – the very core of a caring school community. Honesty, respect, empathy, responsibility, integrity, courtesy, resilience, acceptance, courage and co-operation. These are the character attributes that will be modeled, taught and expected in Rainbow Schools in Sudbury, Espanola and Manitoulin. The ten traits will provide the foundation for ongoing character development at the elementary and secondary level. These character traits are essential in developing and sustaining a safe and caring community. These system traits will be woven into all strands of the curriculum and embedded in the culture of all Rainbow Schools. They will be reflected in our communications with parents and the public as we continue to nurture a strong partnership between home, school and community. The Roots of Empathy character development program will continue in Rainbow elementary schools. 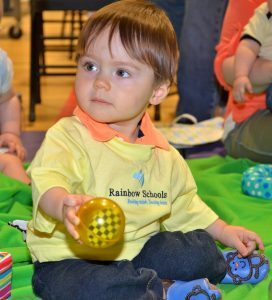 Each participating class adopts a baby who visits the classroom, along with his/her parent and a trained Roots of Empathy instructor, once a month for a full school year. Early Childhood Educators are delivering the Roots of Empathy program in Kindergarten classrooms. As the children observe the parent-infant interaction and follow the baby’s development, they learn how infants grow and develop. They also learn empathetic responses to the baby’s temperament, facial cues and feelings. In the process, they learn to be compassionate and caring citizens of the world. The Province of Ontario's new bullying prevention strategy will help to prevent bullying and tackle its causes. To visit their website, click here.